Ordinance No. Page 6 applicant shall file, in the office of the City Clerk, a copy of the liability insurance policy executed by a company authorized to do insurance business by the City Clerk. 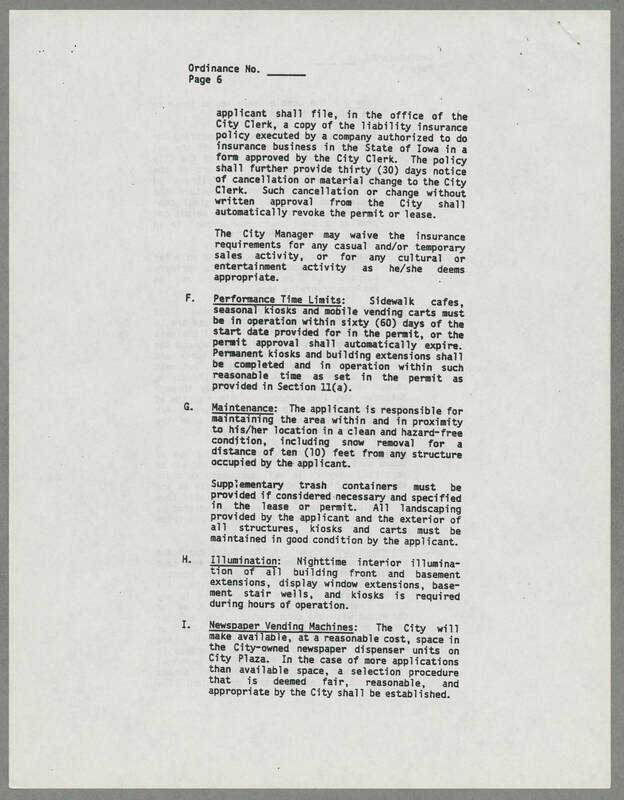 The policy shall further provide thirty (30) days notice of cancellation or material change to the City Clerk. Such cancellation or change without written approval from the City shall automatically revoke the permit or lease. The City Manager may waive the insurance requirements for any casual and/or temporary sales activity, or for any cultural or entertainment activity as he/she deems appropriate. F. Performance Time Limits: Sidewalk cafes, seasonal kiosks and mobile vending carts must be in operation within sixty (60) days of the start date provided for in the permit, or the permit approval shall automatically expire. Permanent kiosks and building extensions shall be completed and in operation within such reasonable time as set in the permit as provided in Section 11(a). G. Maintenance: The applicant is responsible for maintaining the area within and in proximity to his/her location in a clean and hazard-free condition, including snow removal for a distance of ten (10) feet from any structure occupied by the applicant. Supplementary trash containers must be provided if considered necessary and specified in the lease or permit. All landscaping provided by the applicant and the exterior of all structures, kiosks and carts must be maintained in good condition by the applicant. H. Illumination: Nightime interior illumination of all building front and basement extensions, display window extensions, basement stair wells, and kiosks is required during hours of operation. I. Newspaper Vending Machines : The City will make available, at a reasonable cost, space in the City-owned newspaper dispenser units on City Plaza. In the case of more applications than available space, a selection procedure that is deemed fair, reasonable and appropriate by the City shall be established.